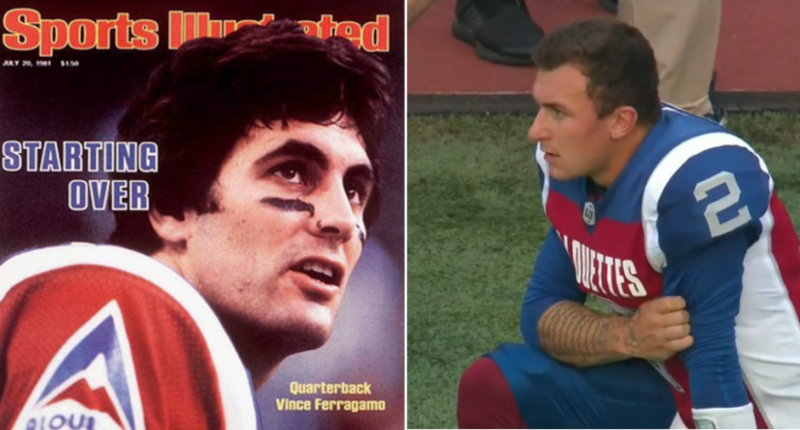 Manziel's four-interception showing was reminiscent of another big-name Montreal QB. Johnny Manziel’s first start in the Canadian Football League did not go as planned. After a July 22 trade from the Hamilton Tiger-Cats to the then 1-4 Montreal Alouettes gave him the chance to play, Manziel (seen at right above) received his first start Friday, and it came against his former team in Hamilton. But the Tiger-Cats scored on their first drive, Manziel threw an interception on his first passing attempt, and he followed that up with three more picks by the half, a point by which Montreal trailed 38-3. Interestingly enough, this had plenty of similarities to another blowout of a Montreal team with a highly-hyped American quarterback. That would be Vince Ferragamo, who led the Los Angeles Rams to a 1980 Super Bowl appearance as a fourth-year player, but only made $52,000 U.S. that year. In an era before NFL free agency, that provided an opportunity for other leagues to swoop in, and Alouettes’ owner Nelson Skalbania signed Ferragamo (as well as first-round NFL picks Keith Gary, David Overstreet and Tom Cousineau, as well as proven NFL receivers Billy “White Shoes” Johnson and James Scott) to a deal reportedly worth $750,000 Canadian (around $600,000 U.S.) per year for four years. But Ferragamo didn’t find a lot of CFL success, and a 58-2 loss in Winnipeg on August 8, 1981 was particularly similar to this one. “I thought we were good because we had some talented people, but you know, just because you see these great people on paper, great players, it doesn’t mean it’s going to mesh,” says Gerry Dattilio, Ferragamo’s backup that day. …”Yeah, I remember the Winnipeg game,” says Vince Ferragamo, almost 37 years later. That sounds a lot like what happened to Manziel Friday, except even worse; Manziel at least was able to pull off a couple of promising plays. And of course, things may not end as poorly for Manziel in the CFL as they did for Ferragamo; Ferragamo completed just 175 of 342 passes (51.2%) for 2175 yards, with seven touchdown passes and 25 interceptions, and while Montreal still made the playoffs despite a 3-13 record (they were better than the 2-14 Toronto Argonauts), they lost 20-16 to Ottawa in the East semifinals. Alouettes’ owner Nelson Skalbania (who would later be infamous for buying and selling the Edmonton Oilers, moving the Atlanta Flames, buying the B.C. Lions and having them forced into receivership, and going to jail in 1998 for using an investor’s money to cover his real-estate firm’s debts) reportedly lost $2 million that year, and the team went bankrupt (they were replaced by a separate short-lived Montreal Concordes franchise; the current Alouettes are a new team that came back to Montreal in 1996, moving from Baltimore after the collapse of CFL USA), so Ferragamo never even got all his money. (He was smart to get some of it up front, though, and he did wind up going back to the NFL in 1982 and having more success there.) However things go for Manziel, at least a full-on team bankruptcy seems unlikely. And it’s quite possible that Manziel could wind up being fine in the CFL. He’s only been with the team for a couple of weeks, and he needs time to learn their playbook and adjust to their personnel. The Alouettes also had lots of issues before Manziel came along; they were 1-4 with all sorts of personnel issues before the trade, so this isn’t all on him. And he could still improve significantly. But Ferragamo is one of the many examples over the years that big-name quarterbacks don’t always work out in the CFL, and that you can’t just walk in and expect to dominate the league. Hopefully Manziel’s stint north of the border will end better than Ferragamo’s did, but his beginnings were certainly similar.